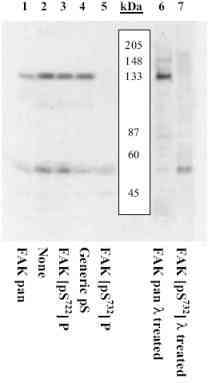 Rabbit polyclonal FAK (phospho S732) antibody. 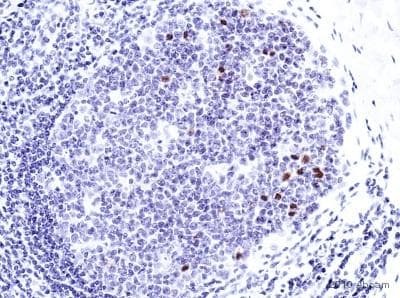 Validated in WB, IHC, ICC/IF and tested in Mouse, Rat, Human. Cited in 4 publication(s). Independently reviewed in 4 review(s). The antibody also reacts with FRNK. Synthetic peptide (Human) derived from the region of human Focal Adhesion Kinase that contains serine 732. The sequence is conserved in mouse, rat and chicken. Cdk5 +/- and cdk5 -/- mouse brain lysates. Focal Adhesion Kinase is a 125 kDa non-receptor protein tyrosine kinase that plays a key role in signalling by growth factors, extracellular matrix and stress signals. Indeed, Focal Adhesion Kinase plays a central role in cell spreading, differentiation, migration, cell death and acceleration of the G1 to S phase transition of the cell cycle. Cyclin-dependent kinase-5 (Cdk5), a serine/threonine kinase and an important regulator in brain development, has been found to be essential for phosphorylation at serine 732. In the context of the Focal Adhesion Kinase-Related Non-Kinase (FRNK), the c-terminal non-kinase domain of Focal Adhesion Kinase that acts as a dominant negative inhibitor of Focal Adhesion Kinase signalling, other serine kinases appear to readily phosphorylate this same site. The functional significance of phosphorylation on serine 732 is yet to be determined. Purified from rabbit serum by sequential epitope-specific chromatography. The antibody has been negatively preadsorbed using (i) a non-phosphopeptide corresponding to the site of phosphorylation to remove antibody that is reactive with non-phosphorylated Focal Adhesion Kinase enzyme and (ii) a generic serine phosphorylated peptide to remove antibody that is reactive with phosphoserine, irrespective of the sequence. The final product is generated by affinity chromatography using a Focal Adhesion Kinase-derived peptide that is phosphorylated at serine 732. Our Abpromise guarantee covers the use of ab4792 in the following tested applications. WB Use a concentration of 0.1 - 0.5 µg/ml. Predicted molecular weight: 125 kDa. Peptide Competition: Extracts prepared from cdk5 +/- mouse brain lysates were resolved by SDS-PAGE on a 10% Tris-glycine gel and transferred to nitrocellulose. Membranes were blocked with a 5% BSA-TBST buffer overnight at 4oC, then were incubated with FAK pan antibody (1), or 0.34 µg/mL ab4792 antibody for two hours at room temperature in a 3% BSA TBST buffer, following prior incubation with: no peptide (2), the phosphopeptide corresponding to ab4792 (3), a generic phosphoserine containing peptide (4), or, the phosphopeptide immunogen (5). 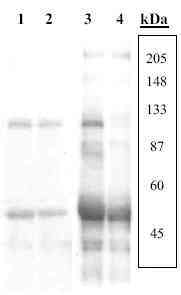 After washing, membranes were incubated with goat F(ab’)2 anti-rabbit IgG alkaline phosphatase and signals were detected using the Tropix WesternStar method. Immunofluorescence labelling of FAK (phospho S732) with antibody ab4792 on mouse Cor 1 cells. Fixative: Formaldehyde. Permeabilization: Tween 20. Blocking step: 1% BSA for 10 mins @ rt°C. ab4792 used at 1/200 for 2 hours in TBS/BSA/azide/Tween. 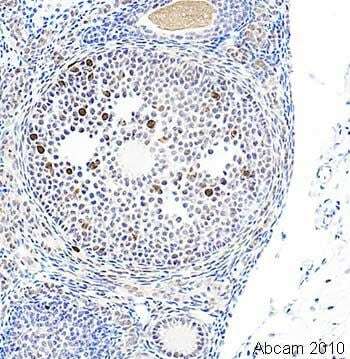 Secondary antibody: anti Rabbit IgG Alexa Fluor® 594 (1/1000). Nuclear positivity of mitotic cells is observed as well as a weaker punctate cytoplasmic positivity. The submitted composite image shows an intensely stained nucleus (upper image) that is clearly a cell in anaphase (lower image of Hoechst staining). To the right side of the upper image, three nuclei exhibit varying degrees of positivity: perhaps these cells are about to enter/leave the mitotic cycle. 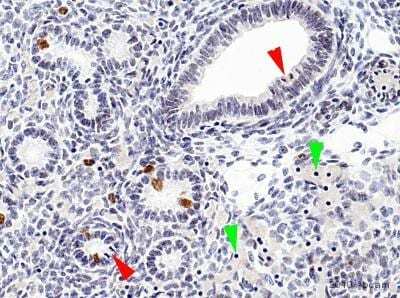 Immunohistochemistical detection of FAK (phospho S732) using antibody (ab4792) on Formaldehyde-fixed paraffin-embedded mosue ovary sections. Antigen retrieval step: Heat mediated; Buffer used: Citric acid pH6; Blocking step: 1% BSA for 10 mins @ rt°C. ab4792 (1/200) incubated for 2 hours in TBS/BSA/azide. Secondary antibody: anti Rabbit IgG conjugated to biotin (1/200). The image shows clear nuclear positivity in the middle secondary follicle specific to mitotic cells. Publishing research using ab4792? Please let us know so that we can cite the reference in this datasheet.